Getting the right pergola (and building it) is surprisingly easy. A pergola is essentially an outdoor room. It is an extension of your living space, and it can completely transform the look of a deck or patio and turn a seldom used space into a stylish outdoor room.The great thing about pergolas are that they define your outdoor space without closing it in. They make a versatile addition to any outdoor space because they can be customized to fit the style of your exteriors, whether it's formal or casual. Pergolas are classic, architectural features that often covered the walkways in Italian Renaissance gardens. They bring us back to an era where art revolutionized our world. This timeless beautiful structure will never go out of style, and they serve a great purpose too. Pergolas put us back in touch with nature as they create a space where we can comfortably enjoy the outdoors. They provide just the right amount of shade for a seating area on the patio. This idea guide features 8 different types of pergolas made with different materials and designs. There is a pergola here for all kinds of styles, needs, and budgets. We hope you will find some interesting and inspiring pergola ideas for your home here. Let's browse through these ideas together shall we? With so many different types of pergola to choose from, it can get quite confusing. To help make your decision easier, think about how you will use the pergola. Is it just a peaceful spot for relaxing and reading, or is it a space for the whole family to get together and perhaps even have meals? Pictured here, a natural woven material atop the pergola provides shade and a fitting rustic touch to the weathered look the seating area carries with its distressed wooden furniture. It also coordinates with the beautiful natural surroundings, creating a casual, laid-back setting which is perfect for soaking in all the wonderful sights. Whenever possible, use local materials so structures better fit into the natural surroundings. Not only does it reflect the area, but locally sourced materials are also a real money saver. The freestanding wooden pergola pictured here creates an elegant focal point for outdoor spaces. Many modern homes these days tend to use their outdoor space as a car park, while missing out on enjoying the outdoor space themselves. Pergolas can separate the car park area from your outdoor haven, and add beauty to your outdoor area. For people who love entertaining guests at home, a pergola provides an extra gathering spot outdoors. Pergolas create an outdoor space where you can get away from it all. Pictured here, we see a pergola composed of wooden panels and transparent roofing. Although pergolas typically only provide partial shade, a transparent roof that let's the light in but provides shelter from the rain is and alternative which suits some people better, especially if you like to sit outside and enjoy the rain under a shelter. Pergolas can enhance the atmosphere of your outdoor area. Together with proper lighting and landscaping, pergolas can create a stunning getaway. A latticed pergola creates interesting shadows and provides the perfect structure for vines to creep along the pergola. The all white pergola pictured here creates a clean modern space where you can even dine if you wanted to. If you have a large patio, don't feel compelled to cover the entire area with a pergola. Here, a pergola is used for just a portion of the space. 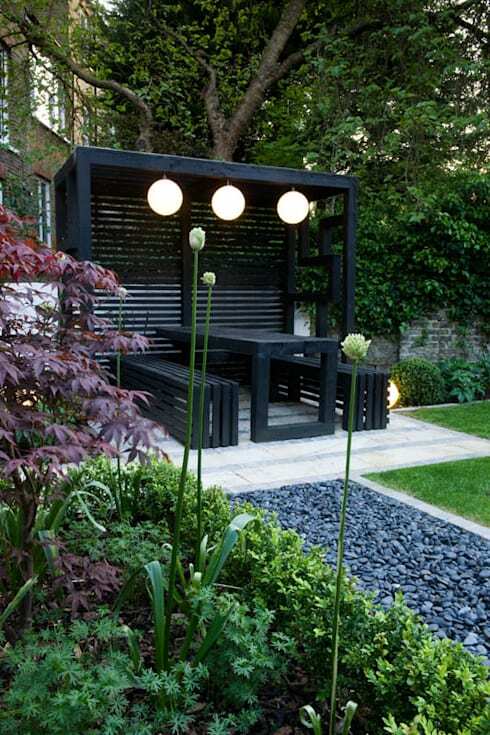 This creates a patio that is multi-functional and more visually interesting. An unusual yet unique way of creating shade for a pergola is to use fabric. Fabric panels soften the look and create a feeling of luxury. Just imagine how tranquil this scene would look when the fabric moves in the wind. Fabric also can add color to your pergola. Pictured here, we see a pergola shaded by soft flowing fabric in a cheery sunny yellow colour. 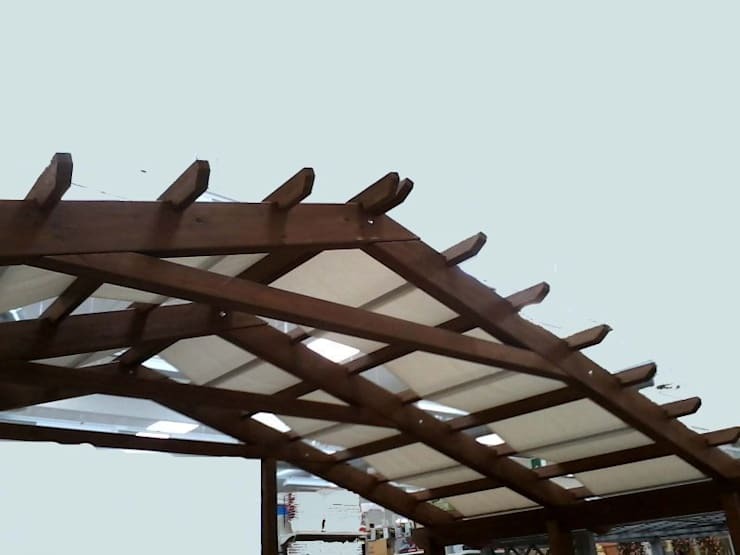 The fabric shaded pergola pictured here is designed by Cagis, professionals specializing in decks, patios, and outdoor enclosures based in Italy. If you're on a budget, and don't have excess to many choices, go for a plastic awning to create a pergola shade. Also, keep the elements in mind when designing for the outdoors. Use a large awning to make the terrace more comfortable during the day. You can also add a ceiling fan to cool things down further. It will also give your outdoor space an indoor feel. When looking for fans, just make sure you select one suited for outdoor use. Constant exposure to the elements means outdoor structures must be durable as well as beautiful. In this sense, metal is a good choice. However, consider whether a metal pergola would match your house's exteriors and style. Browse through pergola designs here on homify for more new ideas and refreshing inspiration. 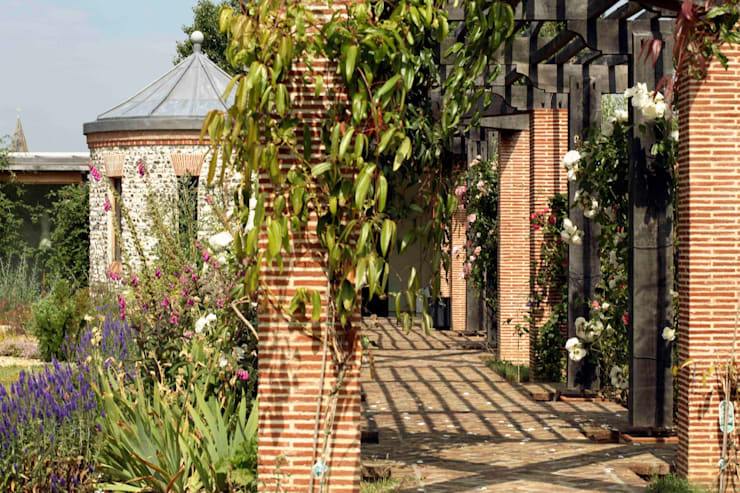 Walkways lined with vine-covered pergolas were very common in medieval Renaissance gardens, and still are today. This is hardly surprising as they are not only gorgeous, but also provide shade for people and plants. We hope you've enjoyed this idea guide as much as we have. For more home tips, inspiration, and interesting ideas, have a look at a beautiful home on a small budget.